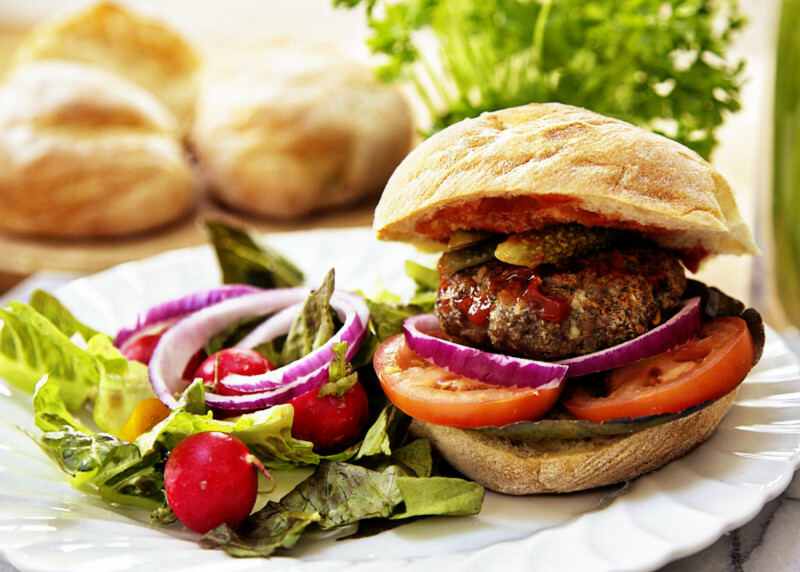 These lean beef burgers are a great source of iron and lean protein. Serve in good quality bread rolls, stuffed with tomatoes and salad leaves for a healthy, budget friendly meal. Peel and finely chop the red onion or shallots. Peel and crush the garlic. Wash and chop the parsley. Make the breadcrumbs. Put the minced beef into a large mixing bowl and add the onion, garlic, parsley, egg, milk, nutmeg, chilli flakes and parmesan if using. Add most of the breadcrumbs, reserving a couple of tablespoons. Mix thoroughly. To make the burgers, roll the mixture into portions the size of a tennis ball. Then press flat with your hands on a chopping board sprinkled with the reserved breadcrumbs. Keep the burgers in the fridge until ready to grill. Brush the burgers with the olive oil and barbecue or grill for 6 minutes on each side, or a little longer if you prefer your burger well done.